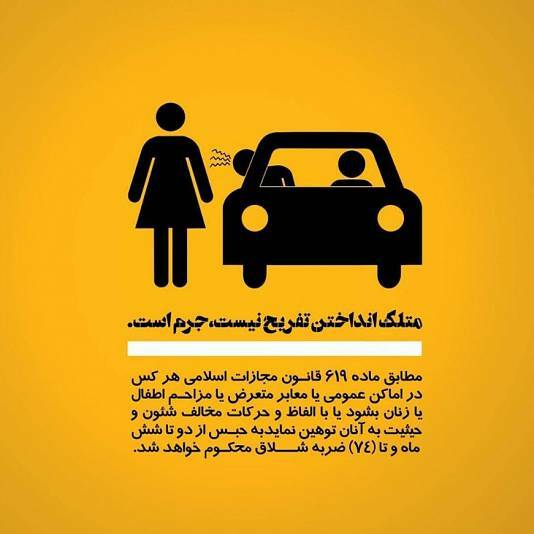 The image was one of four shared by the Iranian president's special assistant for citizens' rights affairs depicting scenes where women were experiencing harassment in the street. 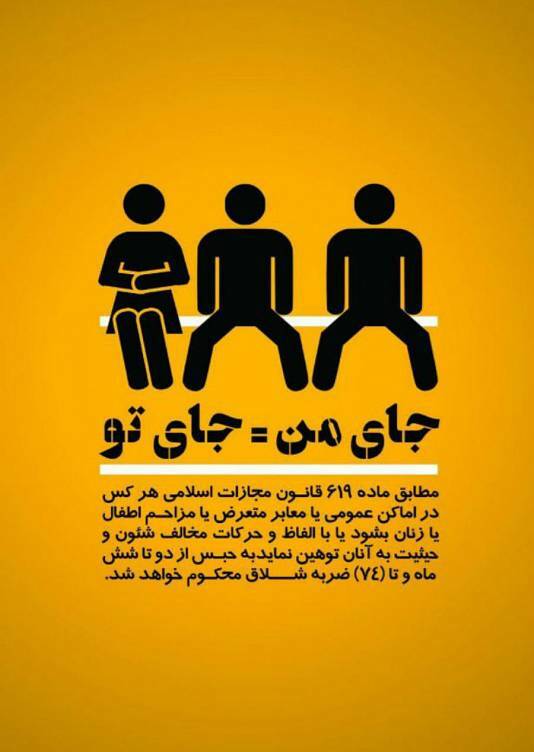 From 'manspreading' to cat calling, a poster campaign highlighting street harassment has gone viral in Iran after a top female member of the Iranian government tweeted about it on Sunday. Images depicting situations of women's personal space being encroached on public transport or scenes of heckling in the streets, were used to spell out the punishment that could be meted out for such behaviour. According to the posters, Islamic law states, "to annoy or insult women or children in a public place could lead to between 2 and 6 months or 74 lashes." * * * Shahidkht Moravardi, the president's special assistant for citizens' rights affairs, drew attention to the campaign on Twitter, causing it to be widely shared on social media. 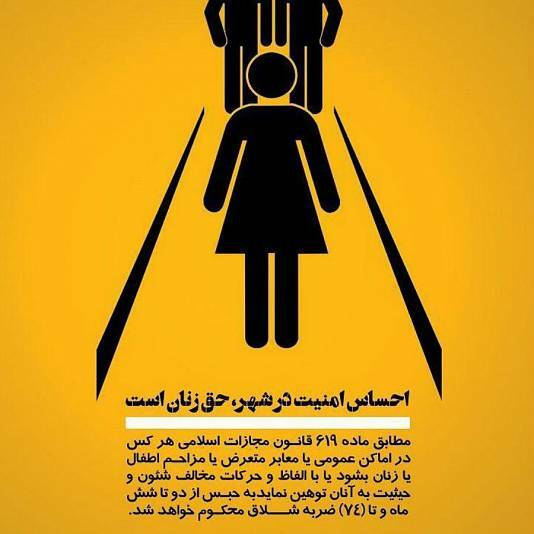 They illustrate what many say are commonplace situations faced by women in Iran. But the campaign was not only online. One Twitter user shared a photo of what she said was the posters stuck on a board at the Sharif University of Technology, a leading university in Tehran. The creator of the campaign is difficult to track down. 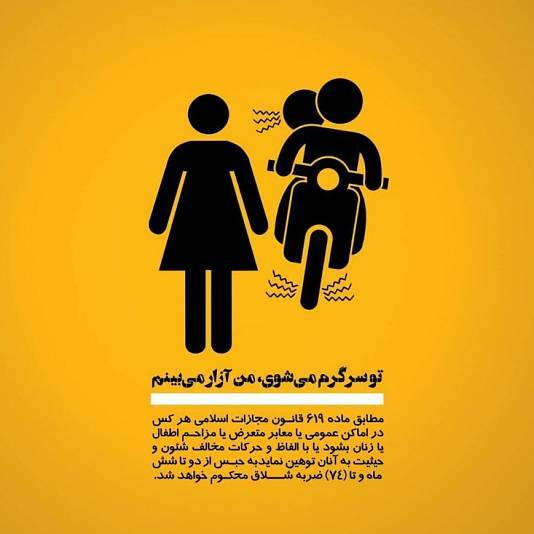 According to Iranian journalist Eelahe Mohammadi, an activist by the name of Saman Salimian created the images, hoping to see it spread widely. "The posters were produced by women's activists and presented to the municipal councillor for women's affairs in the form of a proposal," she wrote. "Women are harassed in all urban environments. Publish these posters for people of the city to see". However, support for the campaign was divided. Although Mohammadi reshared the images she left out the text relating to Islamic law, saying she agreed with the posters' messages but not with flogging. Elsewhere, the campaign was reappropriated to draw attention to the restrictive laws on women's rights. A reference to a recent video to emerge from the hijab protests, depicts a woman waving her headscarf in the air as she is being pushed off a podium by a police officer. The video has drawn a lot of attention in Iran. 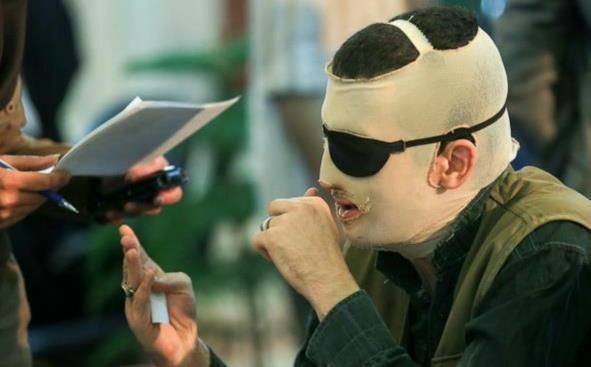 The female protester was in prison with broken legs the following week, according to Jila Baniyaghoob an Iranian journalist and women's rights activist. The subject of women's rights has been a hot topic over the last few months in Iran. Images of Iranian women taking off their veils in protest at mandatory headscarf laws continue to be shared across social media.